There has been a lot of anticipation in the showroom this week as we had a mysterious new countertop arrive carefully packaged and wrapped. 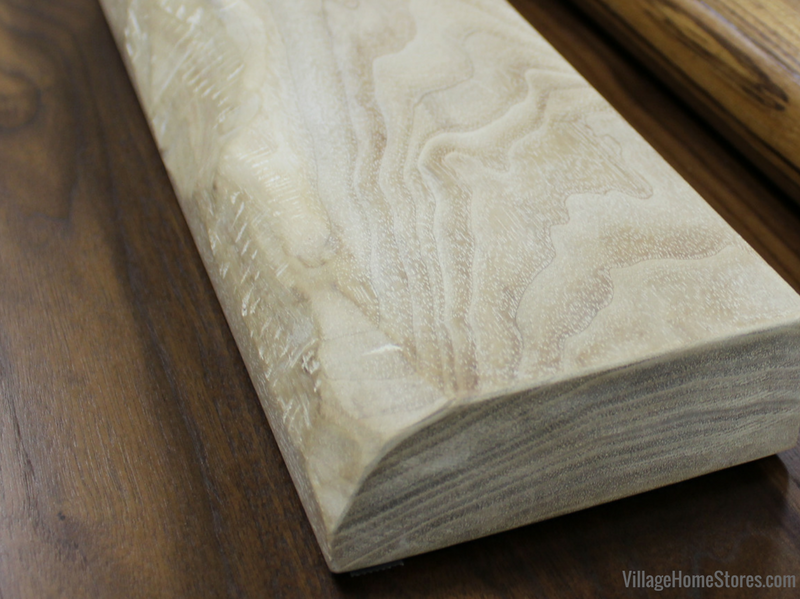 And now… the reveal of a brand new product available to our customers: Craft Art Wood Surfaces for your home! These wood tops are absolutely stunning in person and nearly impossible not to walk up and touch. When we say you need to come in to see and feel this product we mean it. Just a reminder that you never have to have an appointment to wander out showroom. We love it when downtown shoppers come in just to browse the displays. 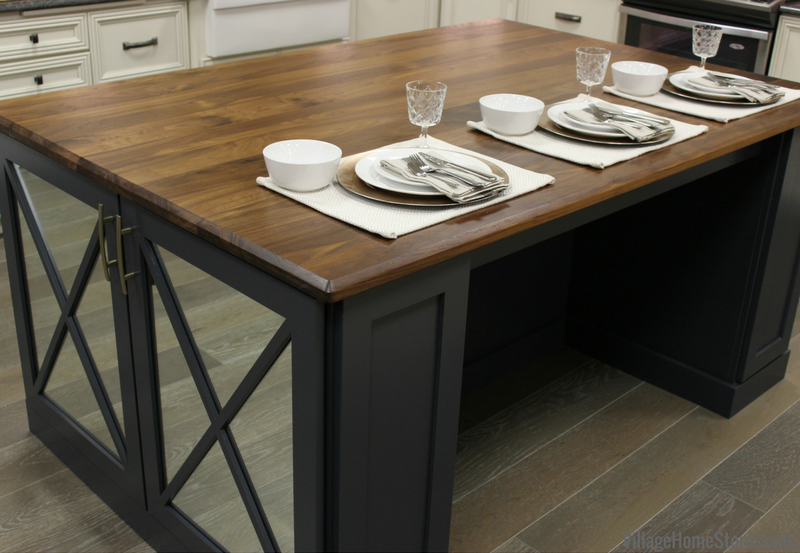 We couldn’t wait to pair our new “Charcoal Blue” Koch painted island with this perfect farmhouse-inspired product for the display. 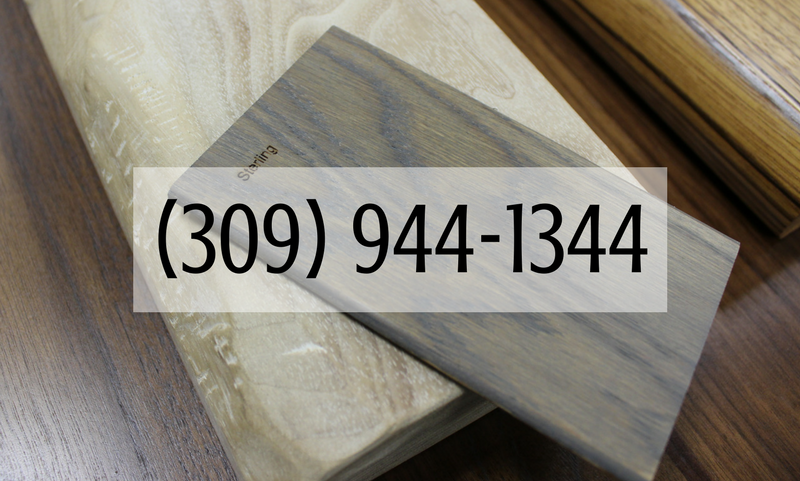 Available in variety of woods, finishes, and edge profiles (1/2″ bevel shown below). 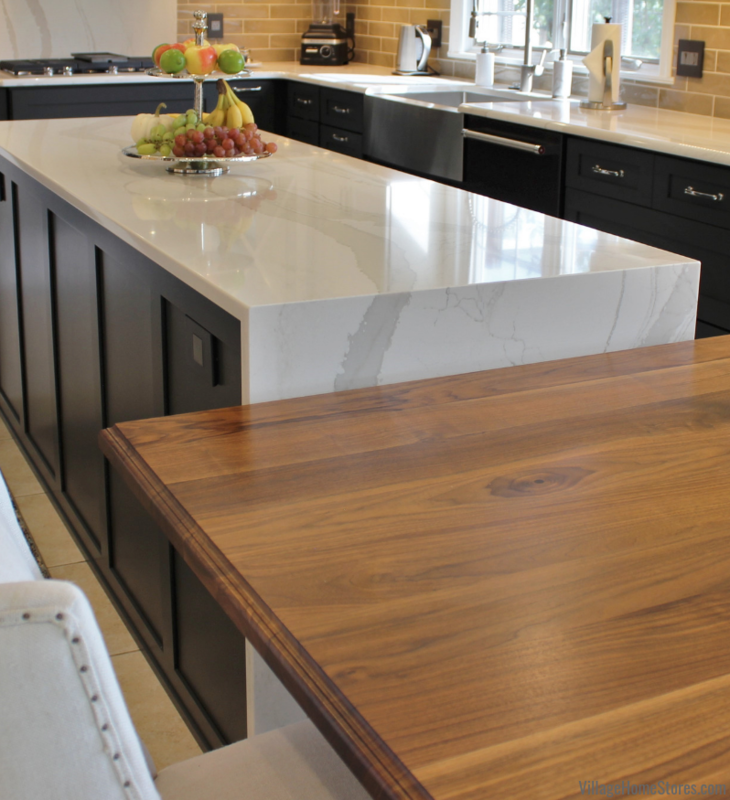 These striking wood countertops warm any space up! 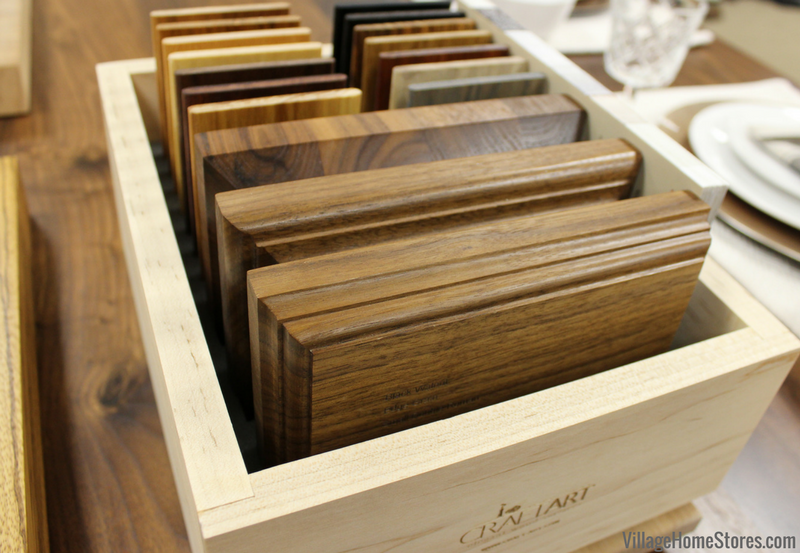 Our display is a warm, rich walnut wood in it’s natural finish. But how does it get that luster? A crosslinked Tung Oil finish is applied. 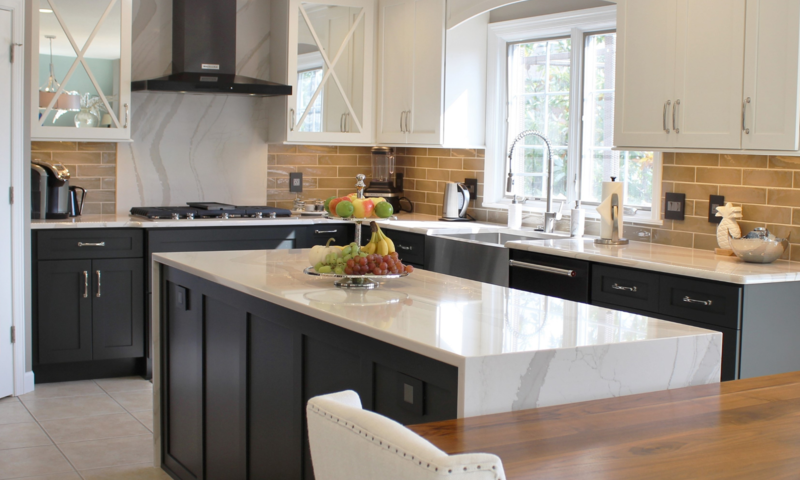 This is how your tops get the look of furniture but the performance you need for countertops. The Tung Oil penetrates the wood so that moisture can’t. The finish in the wood prevents moisture from getting underneath the surface. This makes your wood tops more durable, more resistant to household chemicals, and easier to clean. Something you will notice right away if you have been shopping for wood tops is that the boards in your top are not broken up or scrapped together. Craft Art uses full length boards for their wood islands and butcherblock tops. Never remnants. These tops are also food safe because of the finish process. That makes them safe to use as a food prep area. Need an expert endorsement? Rachel Ray has had Craft Art wood tops in her set kitchens and she uses them to cut, prep, and serve her dishes. She certainly isn’t gong to have time on her show to be worried about spills, stains, or messes. And you know it still looks camera ready after an oiling. Any surface imperfections or scratches from use can be easily sanded out. How much maintenance does “Low Maintenance” mean? All that is required for upkeep of these heirloom-quality tops is to re-oil them monthly. No more work that wiping them clean after use really. Dozens of woods to choose from including Black Walnut, Sapele Mahogany, Zebrawood, Reclaimed Chestnut, Wenge, and many more. 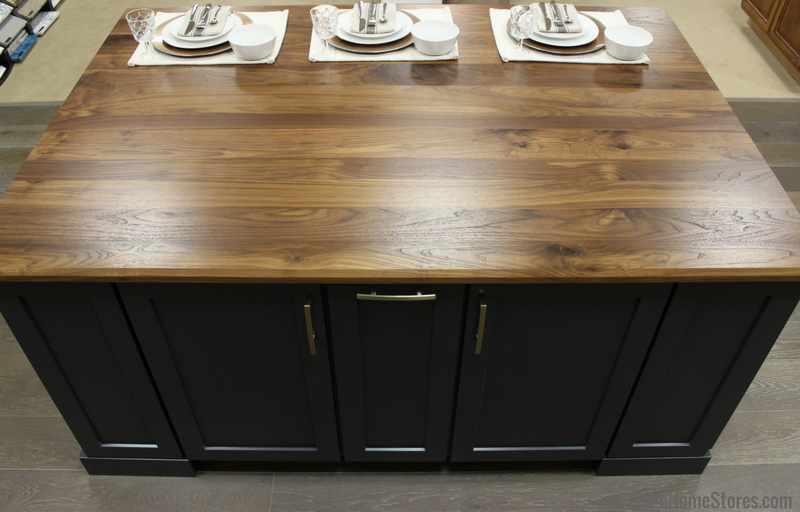 This product is a wonderful addition to two-tone designs and kitchen islands lending themselves to a more furniture look. 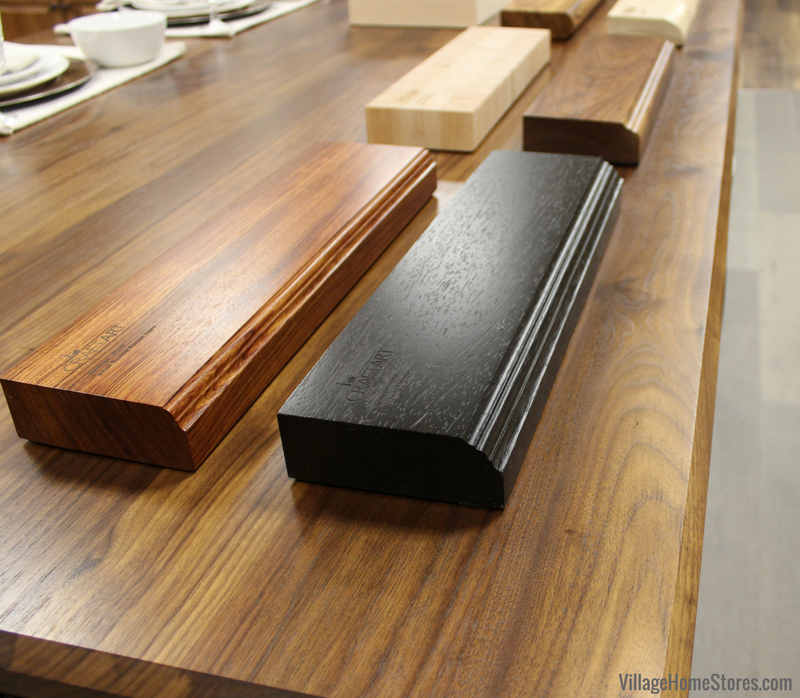 A smooth, rounded bullnose edge, or choose from a variety of ogee edges (shown above) and even an on-trend faux live edge option (shown below on Driftwood Walnut). Not limited to just kitchens, consider this product for your home office, bar, or other spaces. 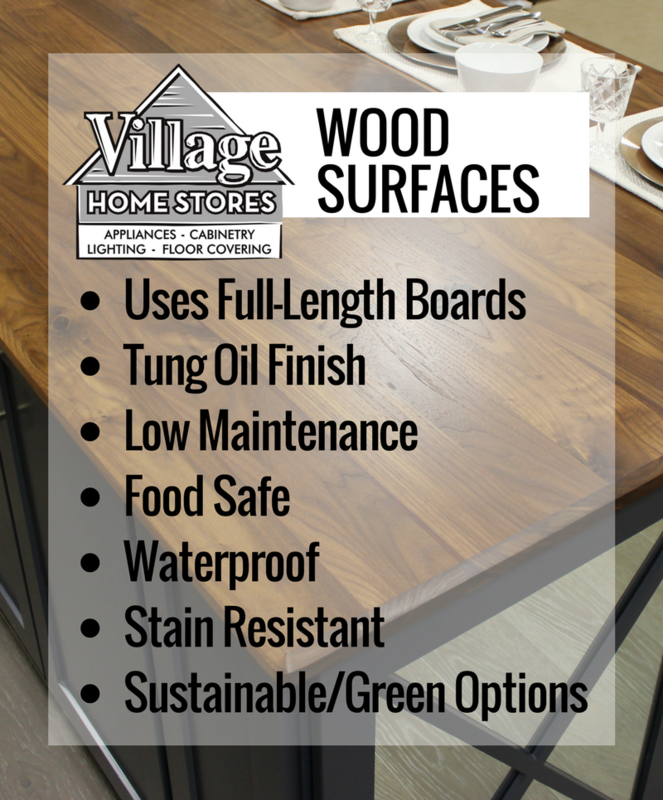 At Village Home Stores we work hard to curate a list of products and services that match the quality our customers have come to expect from us. We have had many requests for a wood top product like this and are thrilled it is now available for our projects. This product also has many sustainable/green options available. Many are even LEED certified materials. While we mentioned before you don’t need an appointment to browse, if you are wanting a quote or any questions answered, we do recommend that you call ahead to be sure we have a design available for you. You can find our store downtown Geneseo, IL at 105 S State Street Monday-Fridays from 9am-5pm and Saturdays from 9am-noon. 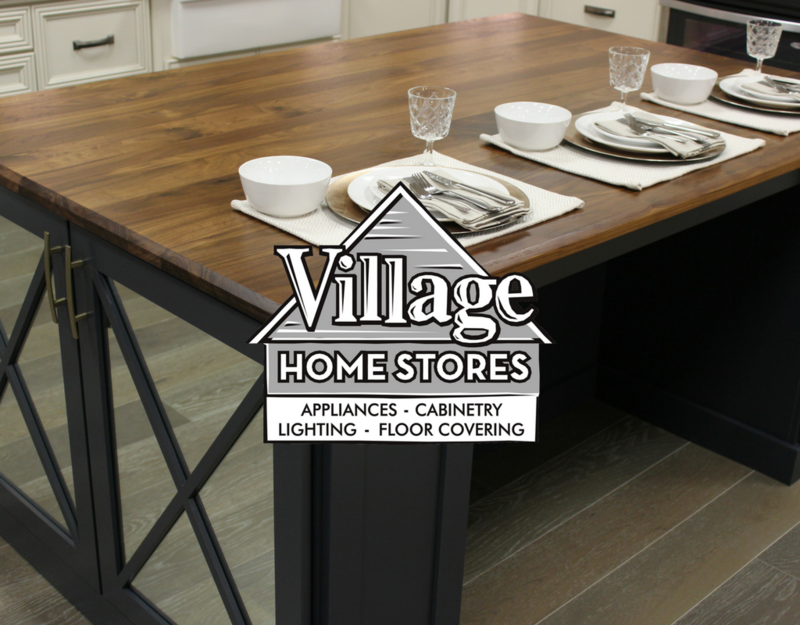 Call us at 309-944-1344 , email us at info@villagehomestores.com or complete this online contact form with any questions for our Kitchen Design team.